San Francisco’s Solar+Storage for Resiliency project aims to expand the solar market by serving as a national model for integrating solar and energy storage into the City's emergency response plans. Under a grant from the U.S. Department of Energy’s Solar Market Pathways Program, SFE worked closely with stakeholders to overcome regulatory, financial and technical barriers to create a road map for deploying solar with storage for resilience. Like other cities working on issues in the intersection of sustainability and emergency preparation, the City and County of San Francisco faces the challenge of being unable to use its sustainable energy resources when the electric grid goes down. In response to these potential risks, SFE explored the feasibility of solar plus storage installations to support community facilities during an emergency while advancing both the city’s energy and emergency preparedness goals. 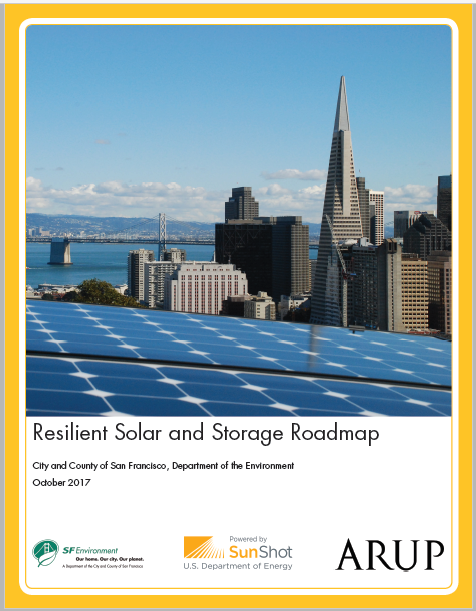 With the grant funding, SFE examined the possibility of solar plus storage in both individual and groups of buildings in the event of the next large-scale disaster in San Francisco, and developed resources and tools, such as Best Practice Guide and SolarResilient.org, for other municipalities nationwide to do the same. Researched SF’s current disaster preparedness plans with respect to electricity needs of buildings. Developed an approach to utilizing existing solar systems during an outage. Addressed technical and economic barriers, and outlined solutions in a road map. Disseminated a plan, such as the Best Practices Manual, to regional, state and national networks. 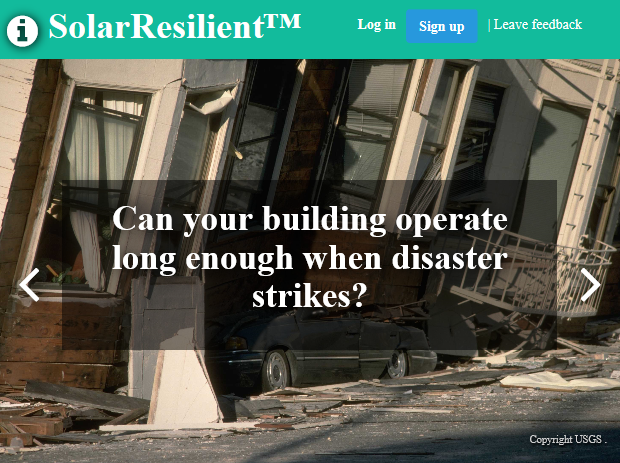 In Spring 2017, the project team released SolarResilient.org, a free, online calculator created to help size batteries to ensure a building has enough power to run critical loads during emergencies. The calculator allows building owners, energy professionals, city departments across the country to develop preliminary solar+storage equipment sizing estimates on a portfolio of buildings so they can incorporate optimum scenarios into their energy resilience strategies. In November 2017, the City released the project Roadmap and Best Practices Guide. The Roadmap documents the entire project from stakeholder engagement to identifying project sites. The Best Practices Guide is a truncated version of the Roadmap with lessons learned and strategies that is specifically targeted towards other municipalities who would also like to explore solar plus storage. Among the most outcomes of this work has been the relationship that has formed between those working on the city’s clean energy programs and the emergency management department. 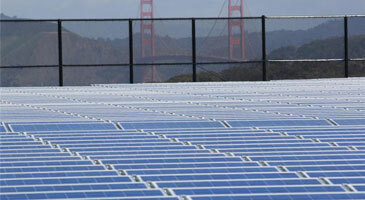 Resilient solar is now a strategy being considered in the city’s emergency management plans. To fund implementation of these projects, the City is working with their capital planning department, speaking with philanthropic donors, and exploring grant opportunities. Documents the project’s steps of identifying critical facilities, surveying power requirements, assessing renewable potential, evaluating financing options to develop S + ES for resiliency, and modeling individual sites for installation. 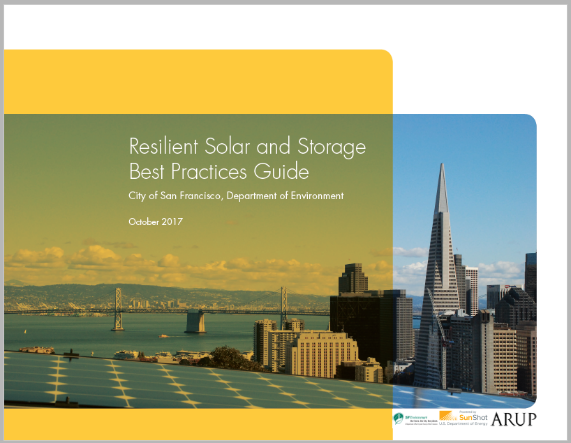 A guide to planning resilient solar and storage for a city’s critical facilities and shelters. This is a truncated version of the Roadmap with highlighted recommended actions at each step of the process, specifically targeted towards other municipalities and jurisdictions. This tool estimates the required rating and physical size of grid-connected photovoltaic (PV) and battery energy storage to provide power for extended periods during a large-scale grid power outage. Analyzes the financial value of energy services provided by Solar and Storage systems studied in the project. The report provides a feasibility assessment to deliver, finance, and operate a system that combines 12.5 MW of energy storage and 8.5 MW of solar generation for a 20-year period. A truncated version of the Financial Analysis Report, so that it can be easily digested by stakeholders. Provides an assessment of the economic value and resilience benefits derived from the implementation of a solar and energy storage system at emergency shelters. A pdf of symposium agenda and PowerPoints presented at the symposium. The purpose of the symposium is to explore technology benefits and policy drivers that could deploy thousands of energy storage in the next few years. This is a summary report of the Solar + Storage for Resilience Workshop. The workshop explored untapped potential of existing PV systems within San Francisco to provide resilient power, and to create a blueprint to upgrade/retrofit PV systems for islanding to boost community resilience and energy security in a disaster. Review of existing emergency response plans (PDF)Review of San Francisco’s and wider U.S. emergency response plans. San Francisco Department of the Environment is the grant lead and worked closely with ARUP, an international engineering firm, during the 3-year project’s scope. Celtic Energy and Strategen Consulting also provided technical support and expertise. Peer review, research support, and dissemination was provided by: Sandia National Laboratories, Lawrence Berkeley National Laboratory, Pacific Gas & Electric, SF Public Utilities Commission, SF Department of Public Health, SF Department of Emergency Management, County of Alameda, Neighborhood Empowerment Network, Neighborhood Emergency Response Team, Renewable Funding, Clean Coalition, Cal-Charge and Urban Sustainability Directors Network. Additional consultant support provided by Matter of Trust. This project is funded by the US Department of Energy’s SunShot Initiative through the Solar Market Pathways Program, which supports 15 projects that are advancing solar deployment across the US. This funding was for the feasibility research and analysis only, and could not be applied towards the installation of PV and energy storage systems.